In part 1 we built a simple web chat using Silverlight 2. Now, we are going to add functionalities so that users are able to choose from multiple chat rooms as well as chat privately with other users. See the revised snapshot of the Silverlight Web Chat. We will still use our the database with an additional field on the PrivateMessage table as shown below. See Part 1 for the table descriptions. The additional PrivateMessage table description is shown below. PrivateMessage: Contains private invitation information. When an invitation to chat privately is sent to another user, an entry is added here. Easily enough, because we started using XAML files based on their functionality in Part 1, we simply need to add two (2) new files; Rooms.xaml and PrivateChat.xaml. Rooms.xaml: Shows a list of chatrooms listed in the Rooms table in our database. So to add new rooms to this web chat application, simply go to the Rooms table and add as many rooms as you like, no additional coding is needed. PrivateChat.xaml: This is the private chat window that pops-up when a user invited to chat by another user accepts the invitation. There is a very minor change in our login mechanism (Login.xaml.cs). As usual, this method is implemented in the LinqChatService service. 2. Rather than going straight to the only room that was availble in Part 1, the user is redirected to the list of rooms page (Rooms.xaml) as shown in line 88. The interface to Rooms.xaml is very straight forward. It contains two (2) controls; a TextBlock used to hold the title, and a StackPanel that holds a list of available rooms	stacked vertically. In the code file (Rooms.xaml.cs), we first check if the user is logged-in in line 26 by checking the UserName. We could just as easily have check the UserID instead of the UserName. Then we get the chatrooms in line 29. As mentioned in Part 1, because we are trying to get values from the client service proxy (WCF Service), we call the "Completed" event of the client proxy before calling the "Async" event, lines 35-36. The proxy_GetRoomsCompleted event retrieves all the available rooms from the Room table and assigns them to a HyperlinkButton, shown in lines 39-55. Notice that line 50 calls the Click event of the HyperlinkButton. When a user clicks one of the rooms listed in the chatroom list, the HyperlinkButton Click event simply "remembers" the RoomID and RoomName (lines 62-64), then redirects (line 67) the user to the Chatroom page (Chatroom.xaml). For more information on the basics of a WCF service, please read Part 1. As you probably have already noticed, there is also a very minor revision in the GUI (graphical user interface) of the Chatroom.xaml page. The GUI revision mostly have nothing to do with functionality. The logged-in UserName was moved on top of the title in a StackPanel, and is now colored gray, line 25. A "Choose Other Room" button is added (line 30) on top of the Log Out button, also in a StackPanel. Notice that we are using a simple StackPanel (lines 43-44) for the list of users instead of an ItemsControl data template control as compared to what we used in Part 1, I will explain why later on in this article. 34             <ScrollViewer x:Name="SvwrMessages" Grid.Row="3" Grid.Column="1"
40             <ScrollViewer x:Name="SvwrUserList" Grid.Row="3" Grid.Column="3"
48                 <TextBox x:Name="TxtMessage" TextWrapping="Wrap" KeyDown="TxtMessage_KeyDown"
Most of the changes here were done to support private messages to other users as well as leaving this room to choose another room. With that said, we will dive right into the intricacies of chatting with other users privately. 1. Getting the Users: As I mentioned above, we changed the ItemsControl to a simple StackPanel that holds the list of users. One of the main reason is that, we want to be able to show all users as HyperlinkButton(s) besides the current logged-in user, which is you (lines 77-107). Simple enough, the idea is; you don't want to click your own name and accidentally chat with your own self. To chat with someone privately, I want to be able to open a new browser when I click a user on the user list. Currently, Silverlight's HyperlinkButton control can only be assigned an absolute URL. So to open up a new browser, we manipulate the current URL in the browser (lines 92-100 above) to build a link for each of the users. Notice in line 96 above that when this user is clicked, it will open the "Chatroom.aspx" ASP.Net page. This is because, like we talked about in Part 1, all the XAML user controls are going to be hosted by only one (1) ASP.Net page, and that page is the Chatroom.aspx page. Because a new browser means new instance of the chat application, the very first XAML user control that we encounter is the App.xaml. So now, how do we load the PrivateChat.xaml user control? We certainly don't want to enter a username and password each time we click another user to chat privately with them. That is why we have a few querystring key/value pairs that are assigned to each user link seen in lines 96-100 above, like the "fromusername", "touserid", etc. We will use the respective values to sign-in the user automatically in the App.xaml user control. The "isinvited" key in line 100 simply states that you are the one inviting the other user to chat privately, and NOT the one being invited, isinvited=false;. I'll talk more about how we use this value later on. Let's jump to the App.xaml user control to see how this process works. You will notice that we added a few public properties to hold and store our application-wide values. By looking at the highlighted code below, you can guess right away that the querystring key/value pairs shown in the HyperlinkButton (above), in the users list inside Chatroom.xaml user control are directly related. Lines 64-69 below retrieves the key/value pairs from the querystring and then assigns them to the public properties of the App.xaml user control. To load the PrivateChat user control instead of the Login user control, we simply check at least one value from the url, indicating that this user has opened a private chat window. In this case, we're just checking the "fromusername" key shown in line 61. Lines 43-53 determines what XAML user control to load. 2. Responding to a Private Chat Invitation. Now back to the Chatroom.xaml user control. We just talked about the process of opening a private chat window so that you can invite another user to chat with you privately. At this point, you have not sent an invitation yet, you just opened the private chat window. You send an invitation to chat as soon as you send your first message to the other user. Let me talk about this process later when we get to the PrivateChat user control part of the article. For now, I will talk about how the other user (the one you're inviting to chat privately) can respond to your invitation. We check the private message invitations from other users to you on the TimerControl's Tick event. In this event we call the GetPrivateMessages method to check for any invitation. This of course calls our WCF service via a client proxy as discussed above. 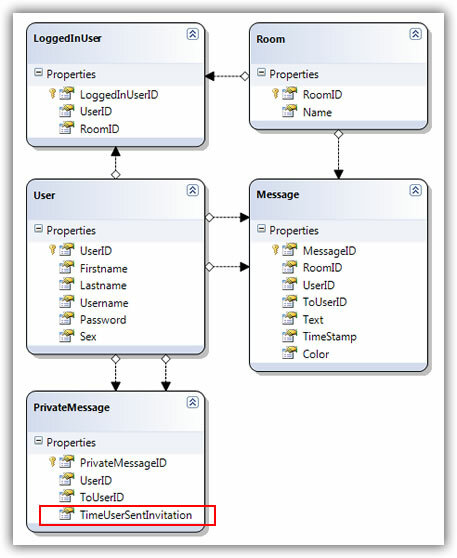 The implementation of getting the private message invitations is shown below, and can be found along with the other implementations of the ILinqChatService interface, in the LinqChatService.svc service. Each invitation will cause to show a Silverlight Popup control as shown in the image below. The code that builds this Popup control for each invitation and causes the pop-up to show can be found in the GetPrivateMessage Completed event shown below. I know what you're thinking, "it takes this much code to show a very simple pop-up control? ", the answer is Yes. What's even more amazing is each of the buttons, the Close and Chat Now buttons have their own Click event code, so that makes the code even longer, line 346 and 357. The code shown below simply adds a TextBlock control, a dummy Chat Now Button control, a Close Button control and a Chat Now HyperlinkButton control to the Grid control which is a Child of the Popup control. The Popup control is set to show or set to be visible as shown in line 285. The dummy Chat Now Button control is used as a "background" control to the real Chat Now HyperlinkButton control so that we can make the HyperlinkButton control look like a button. This is just my preference, you could have as easily assigned the HyperlinkButton control's Content property to show a button, or even design the HyperlinkButton to show like a button. You can see that both the Button and HyperlinkButton are located in the same spot, lines 316 and 328. The close Button and the chat now HyperlinkButton pretty much does the same thing when you click on them as shown in their respective Click events below. They simply get the name of the Popup control to close and then closes them by doing popUp.IsOpen = false. But the chat now HyperlinkButton also opens up the PrivateChat.xaml user control in the browser, much like the same way we opened up a new browser when we invited someone to chat privately with us earlier in this article. This is because we used pretty much the same code as shown in lines 332-341 shown above, the only differences are; the value on the "isinvited" which is "true" in line 340 (signifies that you're the one being invited to chat privately), and another key/value pair is added in line 341, "timeusersentinvitation", which signifies the time the other user sent you the invitation to chat privately. We will use the value from the "timeusersentinvitation" to get all the private messages from the time the the other user sent you an invitation. I will talk more about this later. As you can see, this control looks just like the Chatroom user control, except that some controls are ommited such as the title, log-out button, etc. And because of the similarities, the way we send messages or receive messages works the same way, except we're only sending them to one user. Shown below is the PrivateChat user control GUI code. 20             <ScrollViewer x:Name="SvwrMessages" Grid.Row="1" Grid.Column="1"
27                 <TextBox x:Name="TxtMessage" TextWrapping="Wrap" KeyDown="TxtMessage_KeyDown"
1. Invite Another User to Chat Privately. When you clicked one of the users listed in the Chatroom.xaml page, this private chat window appears. To invite someone to chat privately you first need to send at least one message to the other user. Lines 201-205. The method called in line 203 above is shown below. Because we are not expecting anything to be returned from the WCF service shown below, we need not call the Completed event of the InsertPrivateMessageInvite object. In short, we only need to call the "Async" method of this client proxy. The Async WCF call in line 217 above calls the WCF service method found in LinqChatService.cs. Notice that the async call above and the method below have the same signature. The service below inserts an entry in the PrivateMessage table. 246         // been sent to the particular user "toUserID"
2. Sending Private Messages. In the chatroom, we're getting all the messages displayed from all the users that are chatting. Here, we're only supposed to get messages between the two users privately chatting with each other. This is simple enough to solve. In the Chatroom.xaml user control when we insert a message in the Message table, the "_toUserID" is set to null, here we simply set that value to the user that we're trying to chat with. The _toUserID value is set in this user control's constructor, which is retrieved from the App.xaml's public properties. This makes it very simple to send the message to the other user. 3. Getting Private Messages. Just like when we're sending messages to another user privately, we need to populate the _fromUserID and _toUserID variables to retrieve just the messages meant for this exclusive chat users. Another piece of information we need to populate from the very first time the "inviting" user sent an invitation to chat privately is assigned to the _timeUserSentInvitation variable. This way we will only retrieve the messages from that time on and above. The GetPrivateMessagesCompleted event here does the same thing as the GetMessagesCompleted event in the Chatroom.xaml user control so I'm not going to spend any time explaining it. For more information on the Completed event see Part 1. The Async proxy code above calls the WCF service GetPrivateMessages located in LinqChatService.svc.cs. One thing I would like to stress out is the way we built the query especially the code shown in lines 68-69. We are retrieving all messages sent by either user chatting privately which is "sent to" either user chatting privately. You need to leave your current room to enter another room. You can click the button with the text "Choose Other Room" located in the Chatroom.xaml user control. The click event is shown below. The proxy client method above calls the WCF service method shown below. The only difference with this method and the Log Out method is that; Here we are only setting the RoomID = null in the LoggedInUser table, whereas in the Log Out method, we are totally deleting this user from the LoggedInUser table. Because this is a Web Chat application, you could of course open several browsers, log-in in each browser, and then enter different rooms at the same time. I hope that you learned something out of this article. I did not discuss the basics of WCF (Windows Communication Foundation), nor did I discuss the formatting of the messages in the chatroom because these and others can be found in Part 1. The article is meant for learning the processes of establishing a monitored private chat using Silverlight 2 and MS SQL Server. There are a lot of things that you can improve here. For example, to improve performance, you can change all calls to the database using Stored Procedures instead of Dynamic SQL. Rather than being too chatty, you can also combine calls to the database to make one trip instead of several trips like the methods found in the TimerTick event of the Chatroom.xaml user control.